i have been ill from 2006, no-one could find anything wrong with me yet i felt i was slowly dying. i was diagnosed with spinal stenosis in 2001 but eventually got used to medical retirement and knowing how to look after my back. in 2006 i developed a scalp rash which no dermatologist can explain to this day, also allergies to sulfates, colourings, and preservatives i became very weak, no appetite,no energy, very thin, depression, hibernating from social life etc and i really don't want to live like this anymore. my main symptom which i couldn't cope with was left rib pain radiating to the back and shoulder. anyway to cut a long story short many doctors told me there was nothing wrong with me over the years, however the gp believed me and sent my files of to another hospital. eventually it transpired i have a tumor blocking my main pancreatic duct. (they can't say if its cancer but they think not)i have been offered an operation for a stent to be inserted. but i have to take pancrease HL for a few months and this doc will see me again, my vit d was reading 17, my bones have become painful. i began pancrease HL just 3 days ago, to-day i feel a little stronger wanting to clean house and a lift in my mood. is it possible these capsules are already helping me? i would love an answer to this. thank you. For obvious legal reasons, we cannot diagnose or prescribe for specific medical conditions—merely provide information. That said, the short answer to your question is yes. If your problems stem from pancreatic issues and a blocked pancreatic duct, then supplementing with the digestive enzymes that your pancreas cannot currently provide, could indeed make a big difference in how you feel. But keep in mind, that doesn’t mean that your problem has gone away—only that you have managed to mitigate the symptoms associated with insufficient digestive enzymes somewhat. I just read the article "The Enzyme Story". It was so interesting and beneficial. 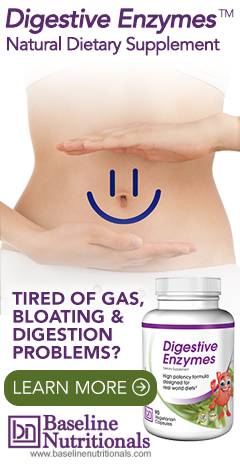 I just started digestive enzymes and am amazed at how much better I feel. I've had stomach problems my whole life with pain, bloating, gas, constipation, acid reflux, irritable bowel, gastritis. Since taking digesting enzymes for about 3 weeks I am 100 percent better. But also I noticed I have so much energy! So that led me to look deeper into the enzyme stories. Well that is one of the many benefits of enzymes! I will take these forever! I am now off Prilosec which I have taken every day for years!! Any other information would be greatly appreciated! hi, thanks for all your valuable information provided in your newsletter. Can your arthritis and enzyme products be sprinkled on food and absorbed properly, receiving the same benefits for the people who are not pill takers? newsletter. Can your arthritis and enzyme products be sprinkled on food and receive the same benefits for non-pill takers. I am not quite sure which products you are referring to. Digestive enzymes you take with food and the proteolytic enzymes you take without food. So, if you are talking about digestive enzymes, that should be fine. However, I would contact the manufacturer, Baseline Nutritionals, for any product related questions. Hi, I am wondering taking amylase with processed food (with simple carbohydrates) will actually break down starches faster hence increase the rate of glucose entering the blood stream. I have learned SO much here at your website. Thank you for all the time you take to enhance your readers' understanding of how our bodies function and how we can overcome obstacles we face as we attempt to eat well, drink healthfully, and etc. The articles about enzymes have been especially helpful to me and this one particular article dispelled the last bit of doubt I had about consuming digestive enzymes with each meal. I had been using them, but a health-care "professional" led me to believe that it could cause my pancreas to learn that it wasn't necessary to produce its enzymes and might quit doing it eventually. Your article makes a lot of sense, because although I eat very well including grass-fed beef (GFB), GFB butter, GFB milk --- often raw unpasteurized and non-homogenized --- free-range pastured chicken's eggs (from hens I raise), and fresh from my garden and/or purchased organic fruits & vegetables raw and/or cooked gently, and I get plenty of sleep and plenty of outdoor/indoor exercise... several years ago I had begun experiencing increasingly extreme distress and discomfort about an hour or so after EVERY meal I ate and it lasted for hours! When it finally subsided, I was hungry again and had only about an hour or so to do all the fun stuff I love doing (I'm 65 and except for that issue, I'm full of energy). Thank you so much for your article... I'm wondering why I was so willing to take the advice of someone else when, through my own experience, I knew digestive enzymes helped me thrive no matter how often I ate... no matter what I ate. Again, thanks! Thank you Flora, we are so glad to hear this article helped you! why hcl an hour after meal? why not 20 minutes before? This website is great! My science fair project is about digestion and this helped a lot. I shared with my parents what I learned from this, and they were impressed. A very interesting and well-written article! My pancreas gastro wants me to take CREON DR 24,000 units capsule . I am concerned to say the least... Do you offer anything compaerble? CREON is the pharmaceutical version of digestive enzymes (protease, amylase, lipase). In addition to being extremely expensive (not a big surprise considering that it’s “pharmaceutical”), it also comes with a host of possible side effects (also not a big surprise). However, if you’re working with a doctor, you need to consult with that doctor before launching off on your own. You can always talk to your doctor about trying a more natural digestive enzyme formula first to see if that accomplishes what your doctor is looking for, which is extremely likely, and in a form that is easier on the body. Wow! What a detailed and very useful article. Thank you so much for imparting your knowledge and I found everything (and lots lots more) that I was looking for. Once again, I feel as if I have just completed a university course on a subject you have blessed us with. As I read and (ahem, npi) digest your explanations, I am fairly brought to tears with thanks for your clarity, conciseness, and erudition. I have to say that I experience almost a reverence for all the years of study and continuing education that you so succinctly present to us. Add to that your refreshing lack of ego with which you present the facts and your on-going research. Thank you, a thousand times thank you, for putting this information out there in all its complexity, without unnecessary jargon. God bless whatever impels you to share this with us. would there be a problem with taking enzymes with the anti-pathogens that Jon recommends, or with things like activated charcoal. The anti-pathogens wouldn't destroy the enzymes would they? 17.5% of the US GDP is dependent on healthcare. Marginally keeping people ill is good for business. Healthcare is an industry, a for-profit institution, keep the money system active, if fills the pockets of the central banking system. Cancer is a 57 billion dollar industry ... what would happen if they finally divulged a cure. Keep this as a foundational understanding when making any choice about nutrition and health. Are enzymes a cure. Awareness, consciousness says - without hesitation - that by witnessing the dependency on overcooked foods in our daily diets, coupled with mass amounts of harmful sugar additives (added to every packaged food you purchase), it strongly suggest that they are purposely removing enzymes from your diet to fund the healthcare industry. Use simple deductive reasoning. They (big pharma, processed foods, healthcare facilities, etc.,) receive their funding from you. Without you no funding ... simple. Connect the dots people to finally arrive at a picture ... meaning just sit and consciously observe, in a public place for starters, and witness the amount of disease and mental fatigue walking around you ... zombies. Without people digesting minds of the same the industries that are reliant on your ignorance would perish. This benefit would be attributed to Common sense and its result would eventually evolve into a healthy nation. Thank you for the very informative article. I was hoping to get your feedback on some pain I'm experiencing after I began taking a number of supplements, including enzymes. I've struggled with IBS for about 4 years that has included a lot of pain, bloating and diarrhea. I've sought help from doctors and nutritionist with no help. Recently I've done research on "leaky gut" and decided to start taking enzymes and other supplements to help heal my digestive tract as a whole. I've been taking probiotics in pill form as well as kefir and kombucha, L-glutamine, licorice root and quercetin. I saw positive results right away and after a few weeks am still seeing positive results. HOWEVER, within the last week I've had some intense pain in my stomach after I eat. Typically after lunch and dinner, irrelevant to what I'm eating. On a side note- I eat very healthy, not perfect by any means but cook a lot of fresh food at home. This is an ache in my stomach and nausea that I've never experienced. I don't want to blame the enzymes as you said they will HELP with ulcers but I didn't experience pain before and now I am and I don't want it to develop into a serious ulcer... HELP? Thank you. For obvious legal reasons, we cannot diagnose or prescribe for specific conditions—merely provide information. First, when you say the pain is in your stomach, are you sure it’s your stomach and not in your transverse colon? Most people do not realize how high their stomach actually sits and hold their hand over their transverse colon when they say they have a stomach ache. If it’s the transverse colon, it’s probably connected to the IBS. If the problem is in the stomach, then you’re most likely looking at something else. You might want to actually work with a holistic healer to identify exactly what and where your new problem is. As for digestive enzymes being a problem, Jon did say they can help with ulcers; but he also said that if you have an ulcer, you need to start slowly as the enzymes can irritate any raw tissue in your stomach or duodenum. Also, you might want to check with the manufacturer of the digestive enzymes you purchased for any guidance they can offer. We contacted the folks at Baseline Nutritionals, and it doesn’t look like you purchased from them. The formula you are using then may be constructed differently than the one described by Jon above. Hi Jon. Great article, I've seen DPP-4 offered as a digestive aid for gluten but my concern is whether this would be a good idea for diabetics. I'm not sure taking it this way will actually elevate DPP-4 in a way that would be harmful to GLP-1 levels as this enzyme inactivates GLP-1 and there is a class of anti diabetic medications that work by inhibiting DPP-4 actually. So taking DPP-4 sounds a bit crazy here for a diabetic. From reading your comments it may not really do much of anything though. Does eating gluten cause a natural secretion of DPP-4 though, giving us another reason to avoid it? So far, studies show only modest to minimal benefits from DPP-IV in regard to gluten and gliadin. As to negative effects, no one has specifically studied that yet, which means no one really knows. Jon’s position on DPP-IV remains unchanged: wait and see. I'm trying to figure out what digestive enzymes I should be taking. I had my gall bladder removed over 30 years ago, I am now age 62, female. I've been eating fairly healthy for the past 7 years, but still I have developed cervical cancer caused by HPV. I've just recently gone on an all raw diet, and have become aware that my PH level is very low. I am assuming that my body is not absorbing the enzymes from the foods I eat properly. Can some one please advise me as to what supplements I should be taking to reverse this? Interesting reading about enzymes. I had a question about pectinase enzyme . It would seem to me that fruits might be better not eaten with protein in a meal if the pectin would interfere with the complete digestion of the protein therefore the pectinase would not be necessary? Thanks for any response. Yes, is part of the theory of food combining, which says which foods can and cannot be eaten with each other. But it should be noted that although pectin is largely found in fruit (especially citrus fruit and apples), it is also found in some vegetables such as potatoes, peas, and carrots. In other words, pectinase is a useful enzyme because pectin is almost impossible to avoid.